A co-production with the FITZ! Zentrum für Figurentheater (puppet theatre), Stuttgart, Théâtre Octobre, Brussels and the Westflügel Leipzig. Sponsored the city of Stuttgart and the Ministerium für Wissenschaft und Kunst (Ministry of Science and Arts), Baden-Württemberg. Oh yes, believe it or not, there were times – golden times – when objects and people lived together in perfect harmony. Everyone had only one example of each object they possessed, and they looked after these objects lovingly and carefully. It was quite normal for someone to be caught sitting next to their chair and if you asked them why, they would answer: “My chair’s not well today.” On the other hand, objects would do everything they could to serve their inventors. Unfortunately, perfect conditions like these don’t last very long. The fear of a given object breaking led to people wanting to possess more than just one example of each object…Abundance led to weariness, stress and to a slow but steady decline in morals. The result was a process of protest and rebellion in which life and objects gradually became uncontrollable.People felt threatened and declared war on objects. This is the story of a break-up. Südkurier: “It makes us laugh, it moves us, it makes us think. The piece as a whole is as thoughtful as a philosophical waltz – just much more entertaining. 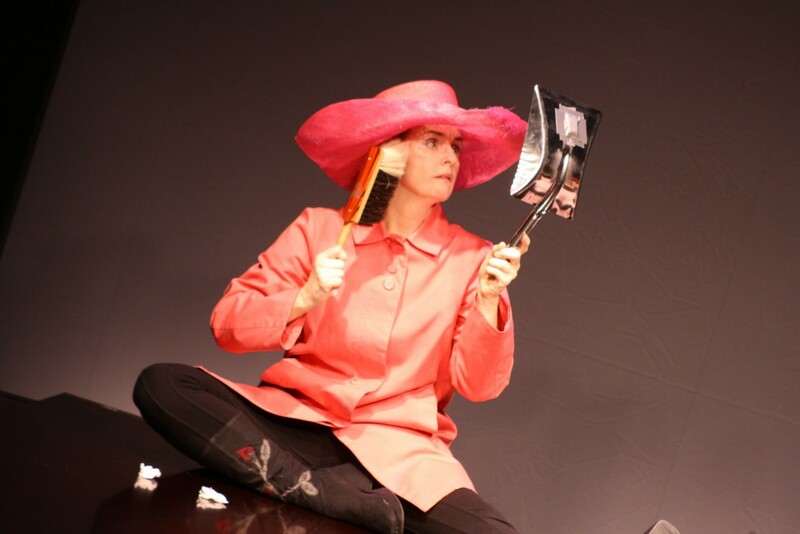 The play asks us about our relationships and connections to objects by giving objects souls – and these relationships become more and more fragile (and decrease in number) as we acquire more objects. And our craving for power increases in direct proportion to the weakening of this connection. A spiral of greed ensues in which our growing amount of possessions somehow destroy the love we have for them and the care we take of them. This criticism of materialism in this play hits us all the more because adults are given the eyes and ears of children. 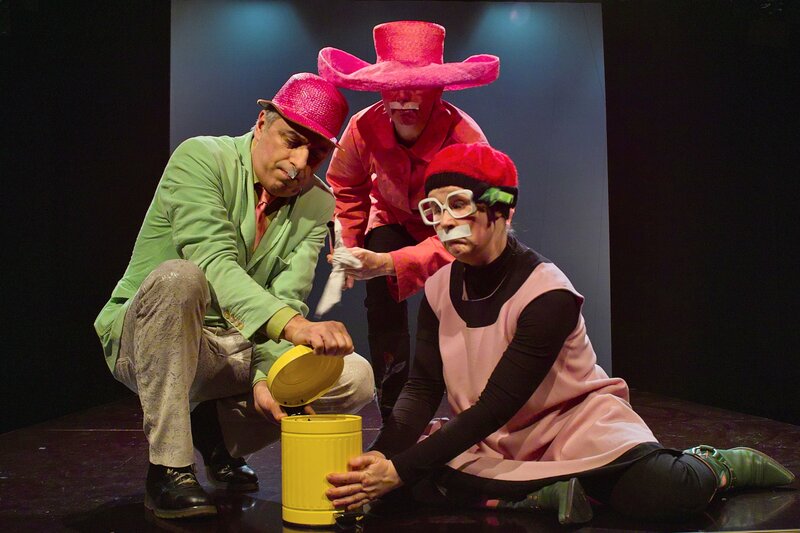 The three actors, who, in brightly-coloured clothes, speaking Nordic, imaginative and fairy-tale inspired language, show us circus clown antics and magic tricks, spinning us a tale that is truly contemporary and critical of our times. Has there ever been a more lonely chair than the one standing on an otherwise bare stage, because its maker has moved on to a newer, more attractive owner? The poor chair has become replaceable. No longer are objects unique, so unique that the people who first owned them, in their confused state of acquisitiveness, had to learn what to do with them. This process of discovery is portrayed on stage with the help of theatrical special effects: objects move around by themselves, rattle and vibrate and allow themselves to be tamed into performing the tasks that their owners eventually realise they are there for. 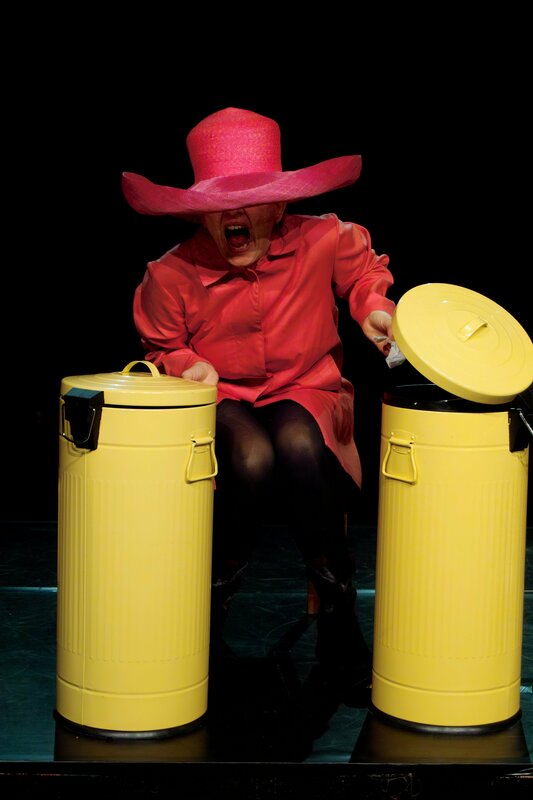 In this way, they ennoble people – for example when the purpose of a dustpan and brush is first discovered, a huge church organ blasts out Richard Strauss’s “Thus Spake Zarathustra”, almost like in Kubrick’s Film 2001. People ascribe tasks to objects and the objects obey our commands – until one day indiscriminate accumulation and the sheer mass of objects destroy people. A Biblical Fall or a way back? The Materialtheater definitely reminds of a lost paradise in which we were happy with what we had. And shows us that this is a paradise that we have lost. 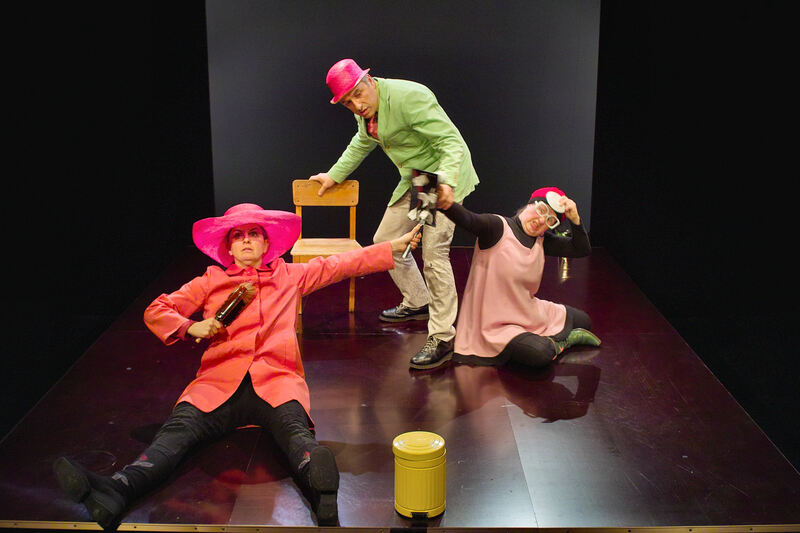 L’Impartial, Neuchâtel:Three Monkeys, with its radically aesthetic, visual language, its wonderfully pure sense of dramatic fun, its constantly surprising stage interpretations and drama, is pure joy. A genuinely original piece of drama, with convincing and skilled actors, comic and philosophical, using both burlesque and object theatre. A breathtaking performance! 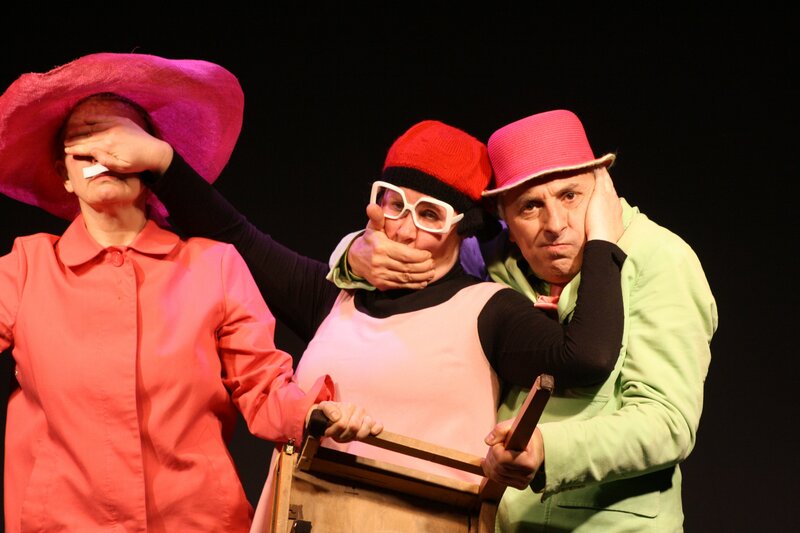 Three Monkeys was performed twice at the International Festival of Puppet Theatre in Jerusalem. 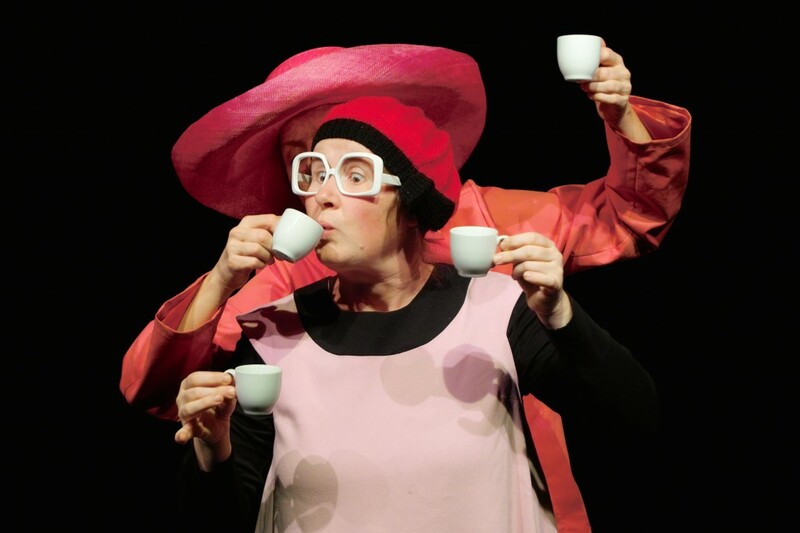 Cup, tissue and broom – all with a life of their own – and all part of this unique, funny and sharp-witted parable. It’s long ago but it used to exist: a world devoid of objects, where people played hide and seek and gave each other imaginary gifts – of for example, mere air. But apparently something was missing, and people embarked on a frantic search, during which they created more and more … objects. People loved and looked after these things as if their lives depended on it. In this world it was quite normal for people not to sit on their chairs but next to them. “My chair isn’t feeling very well today,” they would explain. And then times changed again. The people began to collect and accumulate things. And, as the uniqueness of their possessions waned, their admiration for them slowly slipped away. Broken objects were discarded, thrown in the bin and replaced by new ones. People began to covet more and more new items. They started fighting against their things – and against each other. Non-material presents, once tokens of love, perhaps made only of air, suddenly became empty and meaningless. Until finally the betrayed and exploited objects decided to teach the people a lesson. 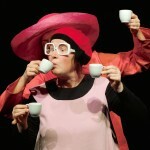 Three actors, supported by a narrator next to the stage, perform these simple, yet intricate events. Using uncomplicated English and a huge amount of talent, they act out the conflicting story of humankind with child-like naivety. The apparently anthropological perspective of the narrator is soon taken at face value. The intentionally exaggerated seriousness with which he tells the simple, short storyline, creates an almost mystic atmosphere. The actors’ gibberish sounds like a very expressive, maybe Nordic language, mixed with other dialects – sometimes its rhythms even sounded like Hebrew. This crisscross of languages gives the play a universal, but also, of course, very comic feel and atmosphere. 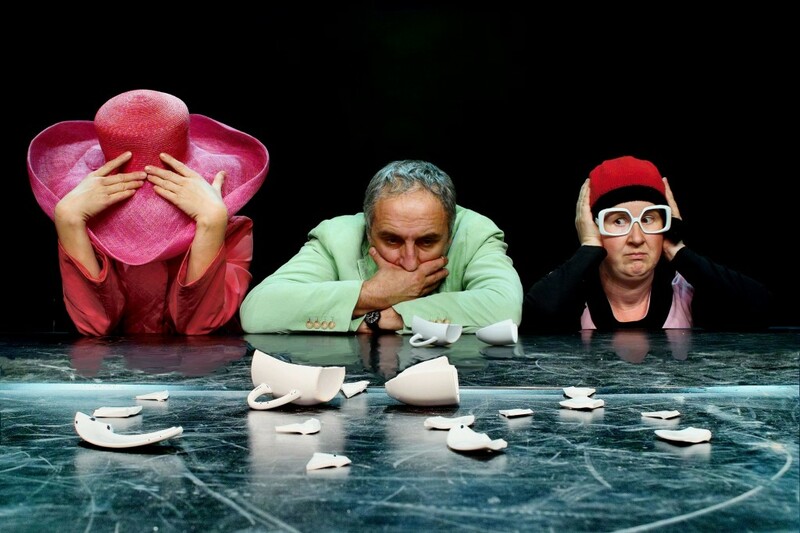 Every time one “act”, or section of the play, ends, the exploitation of the objects by humans worsens dramatically, and the actors begin singing a short song that has the audience in fits of laughter. “It’s not our fault. It’s just human nature,” the actors seem to be defending themselves from blame in song. With the help of invisible threads, tea cups, dustbins, paper tissues, chairs and dustpans all “come to life”. 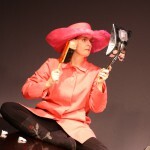 All these objects acquire lives of their own, moving around the stage almost like real actors. The parable of this play achieves a harmonious link between the material and the symbolic. Members of the audience will interpret the play – depending on their personal experiences – ecologically, philosophically, aesthetically or psychologically. All of these approaches are valid and definitely present throughout. 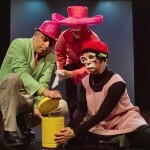 Three Monkeys is a very intense and funny theatrical experience. It is emotionally gripping and makes you forget and set aside your mind and culture. 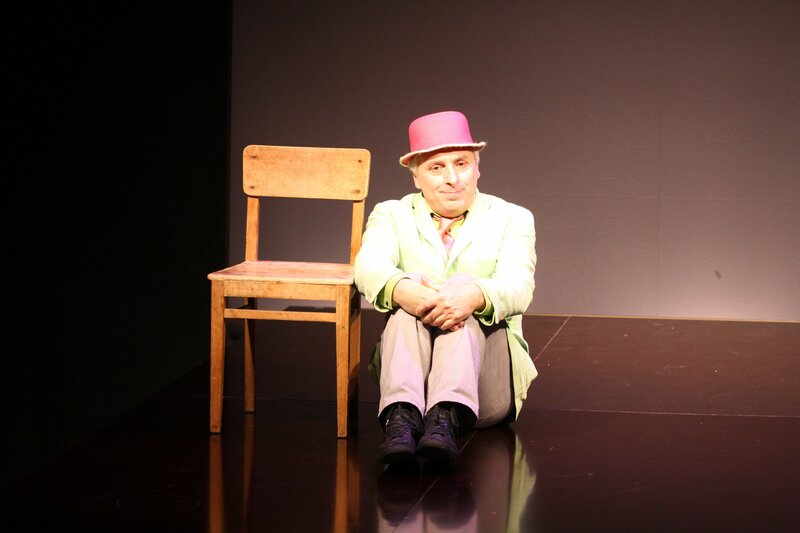 Right at the end of the play, the narrator asks the audience to please leave the hall – the poor, orphaned chair cannot wait any longer and has to lift his leg to have a pee. 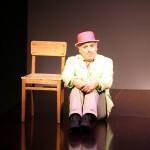 For a short moment, the audience actually feels guilty to be denying the chair its basic need. How does this miracle of the stage work? Beneath the surface of its successful staging lurks an accurate reconstruction of the truly destructive nature of humanity, but told with great sympathy and empathy. Like small children who only live in the present, the actors give free rein to their anger, joy and excitement. In this abstract as well as tangible present, the term “object-relations theory” is brought to life on stage. The virtuosity of the actors stems first of all from the emotionality they arouse. I have rarely seen an audience engage as completely with a play right from the beginning as I saw here. It is only later that you appreciate the actors’ perfect comic timing and body language, the amazing minimalistic costumes and simple colours – and much more besides. And all these things of course rely on a good plot. 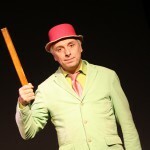 A lot of actors are talented clowns, well trained in mime and have a diverse and impressive array of dramatic tricks. 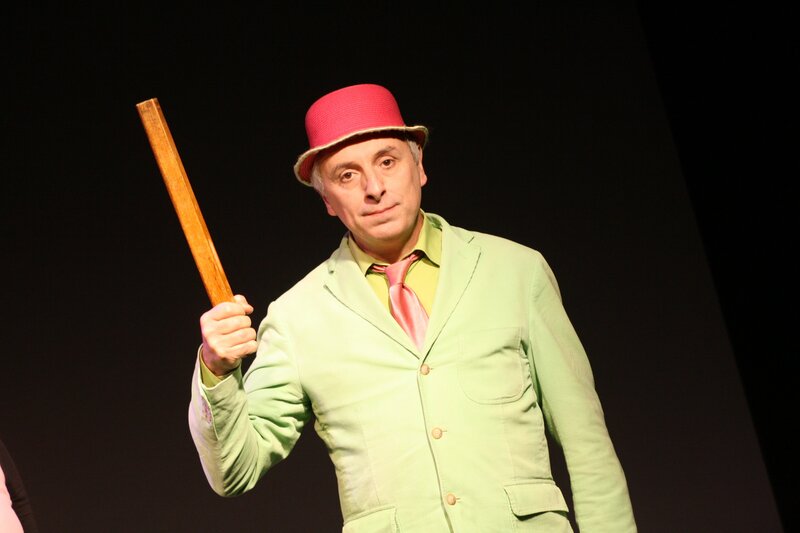 But although there are many plays that fit into the genre “clowns for adults” (a genre that is rarely found in Israel), many of them have no proper substance or enduring impact apart from the artists’ talents. Three Monkeys is different. It not only stands out due to the gifts of its performers, but also because of the depth of the subject matter and the thought-provoking ideas that stay with the audience long after the performance is over. This play gave me some of the funniest moments of my entire life. Unfortunately these three wonderful monkeys were only here in Jerusalem for two days. But it would be well worth flying to Germany for such an extraodinary theatrical experience!